The F6F-5 Hellcat is a Rank II American naval fighter with a battle rating of 3.0 (AB) and 3.7 (RB/SB). 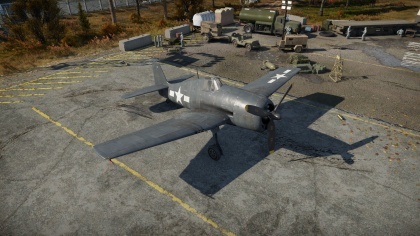 This aircraft has been in game since the start of the Open Beta Test starting out as the F6F-3 Hellcat and was remodeled and updated to the F6F-5 Hellcat in Update 1.65 "Way of the Samurai". The Grumman F6F Hellcat was used extensively in the Pacific Theater of WWII. The Hellcat was the ultimate answer against extremely manouverable Japanese Zeroes. This plane greatly out performed the Zero when taking advantage of high speeds and altitudes. The Hellcat can carry versatile payloads which will allow it to be utilized in various operations to include ground attack. Due to its role as a naval fighter, the F6F-5's take-off distance is small enough to take flight from the carrier decks seen in the game. Powered by a high-output Pratt & Whitney engine, the F6F-5's flight performance centers around this powerful engine combined with a sturdy fuselage. While the bulk makes the plane quite sluggish compared to some of its contemporaries, the characteristics are still favorable for energy retention. This makes the plane very favorable for Boom-n-Zoom tactics against enemies. 6.35 mm Steel plates behind the pilot. 3 mm Steel plates front and rear of the oil cooling system. 3 mm Steel plate on fuselage top in front of pilot. 3 mm Steel plates under engine and oil cooling system. The six machine guns are arranged in bundles of three on each wing. Each are armed with the same amount of ammunition, which means that all guns will fire with each other until empty. The M2 Browning variant on the F6F-5 Hellcat is that of an earlier version of belts. The key to both surviving and owning in the F6F is to keep your speed up and try to be even marginally higher than your opponents. Below 300 km/h (186 mph) it is very sluggish. 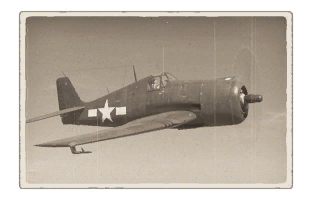 As with most American fighters, Boom & Zoom is the preferred combat mode for the Hellcat, while its moderate high-speed manoeuvrability can be used to add in a high yo-yo. It has a lot of ammo, but a good aim is still important since boom-n-zoom only allows you a small window of opportunity to hit your target before you have to climb back to altitude. Still, this is an excellent aircraft to practice your aim and tactics with because it's more forgiving than most boom-n-zoom fighters. If you don't have a particularly good aim, a good tactic is to open up at 500 m (0.31 mi), starting with your aim on the aircraft, and then slowly move your aim in front of the target. You won't require as much lead when diving on your target at 600+ km/h (373+ mph). With dual 1000-pound bombs and six HVAR rockets armed, the Hellcat is actually a stable game-ending platform in a pinch when the rest of your team is not ground-attacking. The two Tiny Tim Anti-tank rockets can also be good for taking out heavier targets. Sometimes, it is useful to save the Cat as your last plane just for that. You can always jettison the rockets and bombs if you're suddenly forced to dogfight. It is incredibly important to use Manual Engine Controls whilst piloting the Hellcat in Realistic or Simulator Battles. The Hellcat has access to three Supercharger gears, each tailored for a different altitude, and each will greatly improve your performance at their appropriate altitudes. It has a lot of engine power, but at anywhere between 5.7 and 7 tonnes, getting up to altitude isn't very easy. Resist the temptation to get into low-altitude turning fights. This is a heavy aircraft and it will lose a massive amount of speed in turns. While it has plenty of explosive armament options, in Realistic and Simulator battles the added weight and drag will usually make you an easy target for other fighters. Since most air battles are basically dogfights, you're often better off without the extra weight. This thing will perform reasonably well at low altitudes, but it's still recommended to stay at an altitude of 3 km or higher. Performance and machine gun upgrade modules are a must. Unlocking the upgraded ammo belts well increase the lethality of this aircraft. This plane can be a powerful fighter in the right hands due to its performance. Unlocking the performance modules first to increase survivability. Can carry a lot of payload for a Rank II aircraft. One of the few fighters that can carry a torpedo. Very effective in either air-to-air or air-to-ground, very versatile. Bombs are mounted directly under the fuselage, very accurate when dive bombing. Decent at energy fighting, although not as good as the 109 F-4. You have to fly at a very low altitude at very low speed to drop the torpedo, which is impractical. Only 3 salvos of HVAR rockets. Carrying the two 1000 lb bombs and the 6 HVAR rockets add also a worse climb rate. Slower top speed compared to other contemporary US fighters at similar BR. Higher stall speed than its Japanese counterparts. Control stiffening above moderate speeds. Large fuselage cross-section makes it an easy target. Guns mounted further on the wings making it harder to aim at a target that is smaller than you. Despite its formidable reputation as the Zero killer, a Zero could still easily kill it if you are forced to fight on the Zero's terms. The F6F Hellcat was Grumman's next fighter after the successful Wildcat. The F6F was designed from the start to be the ultimate answer against the Japanese Zero. The Hellcat was the planned replacement to the Wildcat since Pearl Harbor. The aircraft was designed from the start to be a much bigger airframe. The plan was to create a carrier based fighter with more ammo, fuel, and larger wings. The XF6F-1 Prototype was already in the works when the U.S. officially entered World War II. Grumman engineers knew they would have to create an aircraft that was faster and climbed better based on combat experience and data collected from the A6M captured in the Aleutians. The prototype flew in June of 1942 and was powered by a Wright Cyclone R-2600. The aircraft's performance was not satisfactory. The decision was made to replace the power plant with the Pratt & Whitney R-2800 Double Wasp. The U.S. Navy needed a new carrier based fighter. The Corsair and the Hellcat were both competing to fill that role. With delays in the F4U Corsair project, the Hellcat took the role as the primary fighter and never looked back. The new Hellcat excelled in nearly every way over the A6M Zeroes it faced. The Hellcat unlike its opponents, featured self sealing fuel tanks and additional armour. The Hellcat quickly gained nicknames like "ace maker". The payload options helped transformed the Hellcat into a multi-role fighter that propelled it to legendary status. During its service life, the F6F was credited with the destruction of over 5,200 aircraft. It remained in service as late as 1954. Skins and camouflages for the F6F series from live.warthunder. This page was last edited on 25 February 2019, at 16:44.